Currently, the cost-of-living-adjustment (COLA) is determined by applying the percentage increase (i.e., 3%) to an eligible retireeâ€™s pension, up to their first $12,000 of retirement benefits, which is the maximum COLA base. The $12,000 maximum base was established in the landmark COLA legislation (Chapter 17) enacted in 1997. Our efforts to increase the $12,000 base, during the 2007-2008 legislative session, have been well chronicled. This bill has two major parts â€“ the first relating to the state employees/teachersâ€™ retirement systems and the other with local retirement systems. Under the state/teacher portion, the maximum COLA base is increased from $12,000 to $16,000.Â In order to accomplish this without an immediate increase in the pension appropriation, the state/teacher funding schedule is extended from 2025 to 2028. The second part is local option legislation, which allows local retirement systems, with the approval of the appropriate legislative body, to increase the $12,000 to a higher maximum base. Since 1999, state/teacher retirees, who can be considered former â€œcareerâ€ employees with at least 25 years of creditable service, are entitled to a minimum $10,000 pension. There is no dispute that inflation has been eroding away the present value of the minimum pension for these long-term retirees. Also, long-term retirees of municipalities, regions, counties, districts and authorities are not currently eligible for this minimum pension. Therefore, it is possible that their pensions fall well below even $10,000. Therefore, it is now appropriate for the Legislature to consider raising the minimum pension to $15,000 for these state/teacher retirees. In addition, this bill would grant local officials with the discretion (option) to offer a $15,000 minimum pension to their long-term retirees who have at least 25 years of creditable service. Option (d) survivors are the spouses of active employees, who die from a non-work related cause before retiring. Currently, they are entitled to a minimum annual pension benefit of $3,000 - an amount that was set some 18 years ago (1990). This bill would raise the benefit to $6,000 annually for these Option (d) survivors. Section 101 survivors are the spouses of accidental disability retirees, who retired beforeÂ November 1996 and die of a cause unrelated to their disability. They currently receive a base survivors pension of $6,000 that has been in place since 1994 when it was raised from $3,000. In keeping in line with inflationary pressures, this bill raises the base level to $9,000 a year. In 2000, the Legislature lifted the restriction that prohibited survivors (other than those receiving Option (c) pensions) from maintaining their pensions if they remarried. It must be noted that survivors, receiving Option (c) pensions, have never been subject to this restriction. While the restriction was eliminated for survivors, who remarried on or after July 1, 2000, it was not for those who remarried before then. This bill would allow those survivors, who had remarried before July 1, 2000 and subsequently lost their pensions, to regain their pensions prospectively (from the lawâ€™s effective date). As part of the Fiscal â€™05 State Budget, anyone who retires on or after July 1, 2004 and selects Option (c), has their retirement benefit calculated, using an updated mortality table. The new table replaced the 1928 mortality table, which had been in effect for some 60 years. Under this bill, the pensions of anyone, who retired prior to 7/1/04 and chose Option (c), would be recalculated using the new table. Retirees can return to public service on a part-time basis (up to 960 hours annually) but are limited as to the amount they can earn, up to the difference between their pension and the current salary for their former job. In order to offset inflation this bill would allow a retiree to earn the difference plus an additional $15,000. In order to offer a more comprehensive life insurance benefit that appropriately reflects current funeral/burial costs, this bill raises the basic life insurance benefit for state retires who are insured through the stateâ€™s Group Insurance Commission (GIC) from $5,000, which was set in 1985, to $10,000. Since municipalities already have the option of setting higher life insurance benefits, no further legislation is required at the local level. 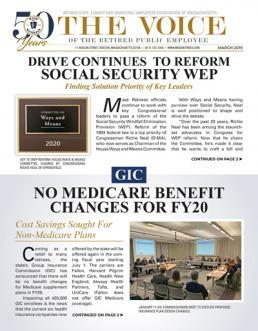 Currently, the Commonwealth has the discretion whether or not to refund the Medicare Part B premium that is paid by retirees and survivors who are insured through the GIC. Since 2002, no refund has been paid. This bill requires the GIC to pay the refund at the same contribution rate as currently paid by those retirees and survivors (either 85 or 90%, depending on date of retirement). The bill also adds a provision to the municipal mandatory Medicare law (MGL Ch. 32B, section 18), requiring municipalities that mandate Medicare enrollment to reimburse retirees for the cost of the Part B Premium. This requirement would only apply to those communities adopting section 18 after the lawâ€™s effective date. All survivors, insured by the state (Chapter 32A) or locaaly (Chapter 32B) forfeit their health insurance benefits when they remarry. This bill would allow survivors to remarry without losing their health insurance coverage. For retirees insured through the GIC, this bill would provide them with the right to appeal the agencyâ€™s denial of coverage, prescription drug copayments or other claims to the GIC commissioners. This process is modeled on that established under the MassHealth Plan, which provides its enrollees with an appeal process. For a variety of reasons, retirees may drop their health insurance coverage with the public employer from which they retired, opting, in most cases, into a private sector plan instead. While they are usually allowed to rejoin their former insurance plan, some municipalities have refused to reinstate retirees, particularly in light of a recent decision by the stateâ€™s highest court that upheld a municipalityâ€™s refusal to reinstate a retiree. This bill would require retirees be allowed to rejoin their respective plans. Allows municipal retirees, insured through the stateâ€™s Group Insurance Commission (GIC) to participate in the retiree-pay-all dental insurance plan. Currently, state retirees and Retired Municipal Teachers (RMTs) can choose to participate in the GIC sponsored dental plan, which offers affordable dental coverage for retirees. This benefit has no mandated cost to the Commonwealth or municipality, as it can entirely a retiree-pay-all plan. Retirees, who have creditable service prior to 1939 and are veterans, are entitled to a refund of their accumulated pension contributions and what is termed a â€œnon-contributory pensionâ€. However, their non-contributory pension is subject to state income tax. This bill would prospectively grant these non-contributory retirees/veterans the same tax-exempt status as all other public pensioners receive. In 2004, the definition of veteran expanded for retirees to include those who served during non-wartime periods, as well as National Guard duty in very limited cases. Unfortunately, this law was only applied prospectively, from 8/26/04 forward. That meant the expanded definition of veteran did not apply to those, who retired on a superannuation (regular) retirement before 8/26/04 and had non-wartime military service (or National Guard duty in very limited cases). These veterans were not eligible for the veterans bonus (up to $300 annually), despite their military service. This bill would extend the expanded definition of veteran to those, who have the requisite non-wartime or National Guard duty and retired on a superannuation retirement before 8/26/04. If enacted, they would then be eligible to receive the veterans bonus prospectively from the effective date of the law. There is a local option provision for acceptance by local retirement systems. PERAC (Public Employee Retirement Administration Commission) is required to periodically reexam disability retirees regardless of their age or the length of time that theyâ€™ve been disabled. Such an open-ended process is unnecessary and wasteful. This bill would end periodic medical reviews of disability retirees, who have been reexamined, at least once, and retired on disability for longer than ten years, unless the retiree requests a reexamination by PERAC. Disability retirees are allowed to work in a limited capacity and earn supplemental income in order to help support their family. They are restricted in the amount of money they are allowed to earn according to a statutory formula set forth in Section 91A.Â However, Section 91A is vague as to what constitutes earned income and does not include a mechanism that allows the statutory formula to be adjusted for inflation. This bill defines earned income and creates an indexing feature that adjusts the permissible amount of a retireeâ€™s earnings for inflation. Under this bill, a disability retiree could opt to convert their disability pension over to a reduced superannuation (regular) retirement allowance. Once a retiree converts, they would be subject the restrictions under Section 91A (see above). Active employees, who can no longer work because of a non-work related disability, can retire on what is known as an ordinary disability pension (Section 6). While veterans receive an ordinary disability pension equal to 50% of their previous twelve-month average salary, non-veterans are eligible for a pension based on a special formula that treats them as if they are age 55 with a 1.5% age factor. The pension is then calculated as 1.5% x their actual years of creditable service. This bill changes the age factor, put in place in 1945, to reflect the longer life expectancy of todayâ€™s society. It proposes treating non-veterans, who apply for an ordinary disability retirement after the effective date of the law, as if they are age 60, by using an age factor of 2.0. In the unlikely event that a veteran would receive a greater benefit under the enhanced formula, they could elect to have their benefit calculated using it. Under MGL Chapter 32, local retirement systems are required to be â€œfully fundedâ€ by 2028. As a result of the severe market losses in 2008, some local retirement systems could be in line for dramatic increases in the annual pension appropriation, paid by local governments, that will now be necessary to meet the 2028 funding deadline. In light of these unprecedented and extraordinary times, we propose the extension of local pension funding schedules beyond 2028. This change would take place by acceptance of the local retirement system, with the approval of PERAC.